The Damale Turquoise mine also called the Damele, Damaile and Damali Turquoise mine is located in east central Nevada near the Carico Lake mine. Damele Turquoise is distinctive because of the zinc content that turns the stone yellow-green and increases its hardness in some cases. The yellow Damale Turquoise is fairly soft material, but is the material that tests possitively as Turquoise. The Damale Nevada Turquoise mine is most famous for the Damale or Damele Variscite and Faustite that is a vivid lime green and shocking Yellow - Lime Green. Most of the time this Lime Green Variscite is referred to as Lime Turquoise or Lime Green Turquoise. There is also real Lime Turquoise that comes from the Damale mine. The matrix of the maretial from Damele is webbed with a dark brown to black matrix. It's availability is limited because the mines are small. Due to its rare color, Damele is a collectible turquoise. The Damele Turquoise Mine also produces very beautiful Varasite, a beautiful, lime greenish to forest green very hard stone, most people know Damele for This stone rather then the Turquoise. There was another mine that was adjucent to the Prince Mine which was named Milky Way and the miner was sell Turquoise from this mine as Damaile Turquoise. This Damaile Mine was known more for the Turquoise the Variscite. In 2006, the Milky Way mine was stripped and robbed and that was the last of that material which was sold at a cut rate price the same year at all the major gem shows under all kinds of different names, including Candelaria Variscite. I love stones from both mines in Turquoise Jewelry and especially in gold turquoise jewelry. The Darling Darlene Turquoise mine is one of the hardest mines to get Turquoise from these days. Most people that own it and had it passed down to them have no idea what it is and usually sell it as "some unknown Nevada Turquoise from Battle Mountain". 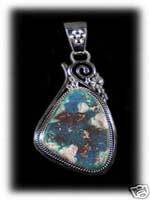 The Darling Darlene mine produced VERY RARE Dark Blue Nevada Turquoise from high up in the Battle Mountain Region. Only a small amount of Turquoise was produced from this mine. The season to mine this stone is very short due to its location. Some very nice high grade gem quality Turquoise. I do not think many people have seen real Darling Darlene Turquoise Mine material, it is fairly illusive, and hard to know unless you buy it from an old tymer that bought it from the mine owner. This is the case with most of the small Nevada Turquoise mine material. That is why there are so many debates about Nevada Turquoise. Another American Turquoise classic. The Dry Creek mine, which has also been known as the Godber and Burnham mine, and now famous as the Dry Creek Mine, is located northeast of Austin, Nevada. The Dry Creek mine has yielded both a pale blue and a cream white Turquoise, but all does have a tint of blue. The stark what material was found to be Aluminite. The unusual white to light blue Turquoise is very hard. The color is due to a preponderance of aluminum rather than copper in the stone's chemistry. The matrix is typically light golden or brown-gray to gray-black. White turquoise, as it is called on the street, is beautiful alone in a piece of jewelry and is especially striking when juxtaposed with other colors of turquoise in a single gold or silver jewelry creation. Since their has been a lot of debate about White Turquoise, one should be clear that most feel there is no such thing as scientifical White Turquoise, it is more of street slang used to describe very pale Turquoise. 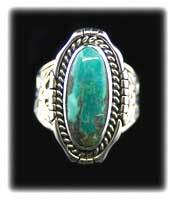 Some unknowing Gallery owners and websites also Refer to Dry Creek Turquoise as "Sacred Buffalo", there is debate as to whether it was named this by the store owners and artists or by the Woods who owned the mine since 1999. Even though the "Sacred Buffalo Turquoise" name is commonly used for this material, expercts consider this name to be street slang for the material and there may be a seperate mine named Sacred Buffalo, but we have never seen it for sale or heard of such a mine from professionals in the business. We have only heard "hear say" about it. 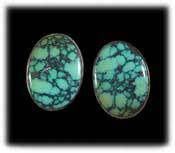 We have found most jewelers, store owners, and consumers are referring to Dry Creek Turquoise when they say "Sacred Buffalo Turquoise". The Easter Blue is an old Nevada Blue Turquoise Mine. This Nevada Turquoise mine is located in the Royston Area / Bunker Hill. The Easter Blue Turquoise Mine was a major producer of Nevada Turquoise up until the 1990s. On occassion the Easter Blue Turquoise mine still produces a fine quality stone with beautiful matrix. The classic Easter Blue Turquoise was a medium to light blue with a dark brown almost mahogany colored matrix. The Easter Blue Mine is owned and operated by Danny and Dean Otteson. 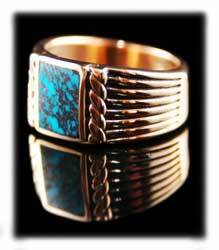 The Easter Blue Turquoise Mine is a classic staple in Native American jewelry. 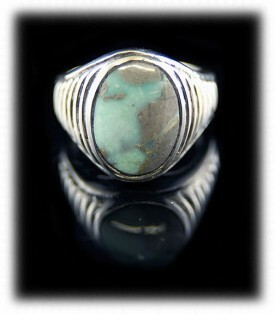 This Nevada Turquoise variety can also be seen in some modern silver and turquoise jewelry. 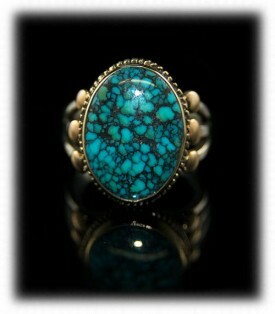 Truly a Classic in American Turquoise and a must have to any serious Turquoise Collector. Emerald Valley is a Nevada Mine that produces a deep forest green Turquoise to a classic Nevada Green Turquoise material. It is very beautiful. The Emerald Green Turquoise mine produced a lot of Chaulk and lower grade Turquoise that was stabilized and cut into calibrated cabochons. Emerald Valley is an American Turquoise and I have seen it on the internet advertised as Chinese, This is false. There is a look of Hubei Turquoise that resembles the Emerald Valley Turquoise mines material and is sold as Emerald Valley Turquoise. It is still being mine by the owner. This is an exceptional stone to put into Gold Jewelry. 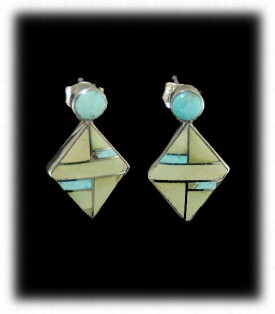 Most makes its way into modern silver and turquoise jewelry. Fox is one of Nevada’s most productive and famous Turquoise mines. In the 1940’s, Dowell Ward purchased the old Cortez claims and developed them using the names Fox Turquoise, White Horse, Green Tree and Smith Turquoise to differentiate among the colors produced in the area and to create a larger perceived share of the turquoise market. The area produces a huge amount of good quality blue, green or blue-green stone with a distinctive matrix. Most of the Fox Turquoise comes out as nugget material. The nuggets from the Fox Turquoise mine are absolutely gorgeous, some bubbly and almost prettier in their natural state as a Turquoise Nugget. Most of this Turquoise that we have cut has been a light to medium blue with a darker color of green or blue spider web which is called water web. The Fox Turquoise Mine in Nevada also produces a beautiful clear blue with no matrix. Most of the Fox Turquoise material that has come out as of late is of the clear medium aqua blue variety. The Gilbert Mine in Nevada produces a beautiful dark blue extremely hard turquoise in a quarts host rock. The material from the Gilbert Nevada Turquoise mine has a dark to medium brown matrix that can even go into a reddish brown. This Turquoise almost has a Bisbee look to it if you have seen Bisbee in Quarts. The best way to know the difference is to have bought it from the miner unless you are a real expert on Turquoise varieties. Having said that, we have even seen so called Turquoise experts make mistakes. The Gilbert Turquoise Mine is a wonderful example of American Turquoise from Nevada. You will definitely see some of this being sold as Bisbee in Turquoise jewelry. The Godber Turquoise Mine aka Burnham Turquoise Mine is one of Nevada's Best and most well known mines. This Godber Nevada Turquoise Mine produced some of the best material to ever come out of Nevada. The old time Godber Turquoise was a deep blue with a brownish spider web matrix. Some of the older Burnham Turquoise mine material is even prettier, dark blue with a green spider web matrix. Stunning! You can see some of this in high end old pawn silver jewelry and some gold and turquoise jewelry. Now this famous old Nevada Turquoise Mine is producing the Dry Creek Turquoise from a new find and is very famous for that material. There are a few of these Turquoise mines in Nevada that have been named several different things by different owners. A small privately owned Nevada Turquoise mine that produced very little Turquoise. We are not sure whether or not This mine is still in production. Judging on the availability we are guessing it is not. Gold Acres is some of the finest blue Turquoise we have seen. Awesome matrix, a lot of the Turquoise is multi-colored. A Nevada Turquoise that has limited production. This turquoise was lost for a number of years, and rediscovered recently by the current owner. This stone is very hard, 8 on the mohs scale. It took ten years to find This mine. Usually a light Blue with triangle pattern matrix. This mine is owned and operated by Durango Silver Co. and Nevada Turquoise Company. Our latest finds here are yeilding some material that is Larimar blue with golden yellow matrix. Very pretty! The Harcross Mine in Nevada is another one of the many small family owned Nevada Turquoise Mines that was only mined for Turquoise. The Harcross Turquoise Mine produces some very nice "non-Nevada" looking turquoise that is a medium blue to medium green and has some gorgeous coloring that looks simular to the Turquoise Mountain Turquoise from Kingman Turquoise. Beautiful Stuff! The Harcross Turquoise Mine produces turquoise that looks a lot like Royston or Pilot Mountain Turquoise from Nevada. This is kind of a common look of Turquoise to come out of Nevada Turquoise Mines. 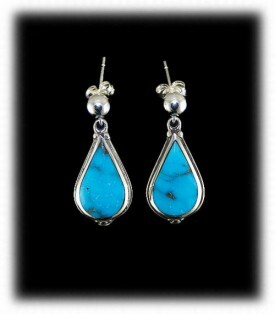 There has not been a lot of this particular Turquoise used in jewelry that we have seen. We made up a few pieces with the samples we were able to obtain that turned out really neat! The Hidden Treasure mine is definitely as it is named. Yet another of the many very small Nevada Turquoise mines that is tucked away in the Nevada hills. This is a rare stone was hard to come by as this mine is not readily available in the commercial market. The Hidden Treasure mine was in active for many years. It is now called Cheyenne. Cheyenne is a relatively old inactive mine once called the "carrie" mine or "hidden treasure" mine. It was originally staked and mined for its silver and gold prospects. Tony and Trenton Otteson staked this claim several years ago to re-open the mine and gather the Cheyenne Turquoise found here. The Cheyenne turquoise formed here is a bi-product of the mineral seem and colors here cover nearly the entire spectrum in the turquoise world. Standing out from this mine is the green web and the blue web. This Cheyenne turquoise rivals any top mine for color and grade in the world.Nice stuff. The Cheyenne Turquoise mine is now owned by the Robbin's family. The Hidden Treasure Turquoise Mine produces turquoise that looks a lot like Arizona Turquoise. The Indian Blue Mine produces a medium colored finely webbed turquoise. The Indian Blue Turquoise mine produces a very fine product and is usually in a dark black chert. Nice stuff, haven't seen a lot, but what I saw was pretty dang nice. 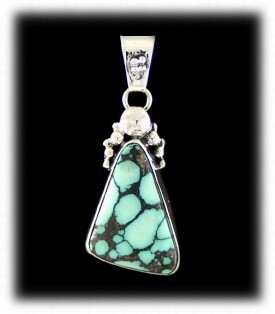 A lot of people love this kind of black spiderweb Turquoise that is indicitive to Nevada Turquoise Mines. The Indian Blue Turquoise mine appears to be a lost "Hat Mine" and I would not doubt if the majority of the material was sold as material from another more famous mine that would bring more money. This kind of behavior is common place in the Turquoise market. If a good amount of this Turquoise were ever to hit the market at the right price and get into some great jewelry there would be a very high demand for it. We would love to put more of this in our turquoise jewelry. The best known of the contemporary mines was originally discovered in 1970’s by a Shoshone sheepherder who stumbled upon a vein of turquoise on a hillside while tending his sheep. Eddy Mauzy and his family mined and marketed turquoise from This site to top southwest Indian artists. 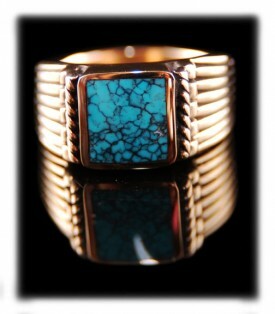 Jewelry featuring Indian Mountain turquoise was featured in Arizona Highways magazine in the 1970’s. Indian Mountain mine is in Lander County, Nevada. Indian Mountain Turquoise mine has produced a fair amount of fine deep blue spiderweb Turquoise that rivals the best of Lander Blue Turquoise. 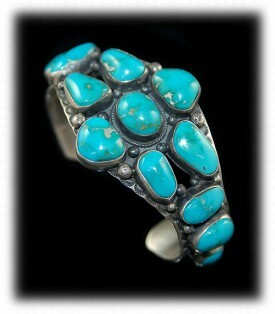 Any fine or accompished silversmith or jewelry knows of this Turquoise and will pay dearly for it. 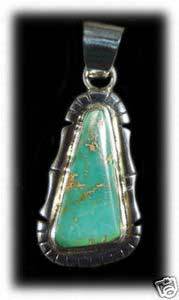 Indian Mountain Turquoise is not a common variety of Turquoise and it fetches uncommon prices. Most of the beautiful Spiderweb Turquoise from the Indian Mountain Turquoise Mine is set in Gold Jewelry and gold and silver jewelry. 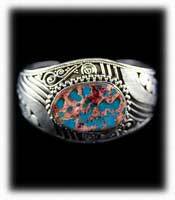 Indian Mountain is only used in the finest American Silver Jewelry and Gold Jewelry. The Original Ivanhoe Mine was located on one of JW Edgars 1100 Acre Mining Leases in his Nevada area and had many beautiful shades of color. This little mine produced some beautiful stuff. The Edgars were one of the largest Turquoise mining families to ever work in the United States. The Edgars are synonomous with Nevada Turquoise and anyone who is anyone in the Turquoise world knows the Edgars or knows of them. Cutler Edgar was the first of the edgars to mine in Nevada and openned many fine old Turquoise mines such as the Stormy Mountain Turquoise mine. Today not much is known about the Ivanhoe Turquoise mine, it would not be suprising if it is not being worked or if it is being worked under a new name. The Lander Blue Turquoise Mine is one of the most famous Nevada Turquoise Mines to ever be. Every Turquoise expert and lover dreams of having at least one piece of Lander Blue Turquoise. Rita J. Hapgold, a blackjack dealer at the Nevada Club in Battle Mountain, discovered This turquoise deposit in 1973 while picnicking at Indian Creek. She collected some nuggets in a can and later claimed the site as the Mary Louise Lode Mining Claim. Later that year she sold her claim to Marvin Syme and Henry Dorian, who formed theLander Blue Turquoise Corporation. The Lander Blue Turquoise Mine was a "hat mine" so called because you could cover it with a hat, only 98 pounds of gem turquoise was ever recovered from it. Today this is the rarest and most desireable of all Southwestern turquoise classics and is also of the highest grade and thus, pound for pound, the most valuable turquoise in the world. Bang Bang..... you know this is expensive silver and gold turquoise jewelry. Cabochons cut from the Lander Blue Turquoise Mine range in prices of hundreds of dollars per carat and are the most expensive of all American Turquoise. The Lander Blue Turquoise mine will always be one of the most famous little mines to every come out of Nevada. It is very important to do a lot of homework before buying a so called piece of Lander Blue Turquoise or Lander's Blue Turquoise jewelry. You will rarely find authentic Lander Blue Turquoise Jewelry for sale and almost NEVER see real Lander Blue Turquoise cabochons for sale. You will see many people faking this Turquoise to try to get the extreme prices it brings per carat, do not be fooled. Never buy this type of jewelry or stone from discount shops or auction sites, you will get taken. Lander Blue Turquoise is never on sale and most of this fine Turquoise was used up in the 1970s. There are small stashes here and there of a couple cabochons, or a handful of rough, but it is as rare as hens teeth and everyone is quick to try to call their black matrix spiderweb Turquoise Lander Blue Turquoise. If you have read much of my information, you know there are several other mines in Nevada that produce top grade black spider web Turquoise that is very close to Lander Blue, but an expert can see the difference. The Last Chance Turquoise Mine was one of the original names for one of the claims in the Godber / Burnham Turquoise mine area located in Lander County Nevada. This old time Nevada Turquoise mine became very famous later as the Godber Turquoise mine, the Burnham Turquoise mine and now the Dry Creek Turquoise mine. The Last Chance Turquoise Mine produced mainly of deep blue and black spider web turquoise. This material is Very Rare even today. The color of Turquoise that was being pulled out of the Last Chance Turquoise Mine does not come out often these days since the mine has been bought and sold several times. That does not mean that the owners of the mine which is currently named the Godber / Burnham / Dry Creek Turquoise mine, will not hit another small vein of the deep blue Turquoise that made Last Chane Turquoie Mine Famous. A lot of this turquoise was sold in turquoise jewelry as Lander Blue to those who did not know what they were looking at. As with many of the fine spider web Turquoise mines in Nevada, this one has been sold as many other Turquoise mines. The Lazy Old Men Mine is located north of Austin, Nevada and has three co-owners who are located in the Reno, area. So far the Lazy Old Man Mine has produced a wide variety of variscite, turquoise, and some chalcociderite, and faustite. There is a lot of silica in the Lazy Old Man Mine so some of our material is quite hard, the host rock at the site is mostly shale but there are times when your working with a demolition hammer and sparks are flying because the silica content is so high. The material from the Lazy Old Man Mine resembles material from the New Landers mine, the Prince Turquoise Mine, and the Tortoise Turquoise Mines in Nevada as well as the Snowville Variscite material. A lot of what has come out so far is mint green in color and features a smoky black matrix or spiderweb matrix. This Nevada Turquoise mine is being worked currently and is relatively new. It will be exciting to watch it develope throughout the years. 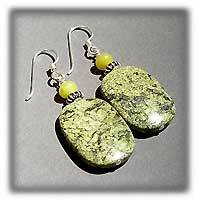 The Leaning Shack mine produces a light yellow to medium yellow green faustite, or to the retail customer "Yellow Turquoise". The Leaning Shack Mine has not been developed much as prior to the 2000s this material was not a hot commodity. As we all know Blue Turquoise is king, and this was especially true prior to the modern times. There were even times in the past where yellow turquoise, lime turquoise, and the like where thrown aside or into the tailings piles. Today, all of the odd colors of Turquoise are very popular, especially the limey greens and the yellows. The Leaning Shack mine delivers this type of gem in the form Faustite, Chalcociderite and Variscite. Most of the Leaning Shack Faustite looks very simular to the material coming out of Tibet right now that is actually called Lizardite. This is a small Nevada mine and is rare stuff due to the small production of this material. Nice material. This stuff makes some interesting silver jewelry, some of the most beautiful is the silver jewelry being made with Leaning Shack Yellow Faustite and purple Sugilite. The Lone Mountain Turquoise Mine is located in Esmeralda County, Nevada. The turquoise is noted for its ability to hold its color and not fade. The Lone Mountain Turquoise mine is one of the most famous of all Nevada Turquoise Mines, well for that mater all Turquoise mines in the world. Lone Mountain Turquoise is considered to be in the top ten most collectible Turquoise varieties on the planet and highly sought after. It is very rare to find the top end Lone Mountain Turquoise. What is considered top grade material from the Lone Mountain mine is a medium to dark blue with jet black spider web matrix. 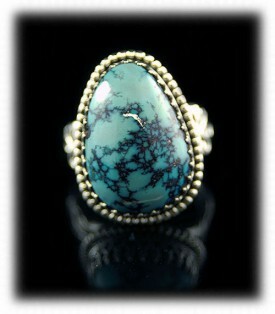 Usually found in nodules, Lone Mountain turquoise ranges in color from clear blue to spider-web. 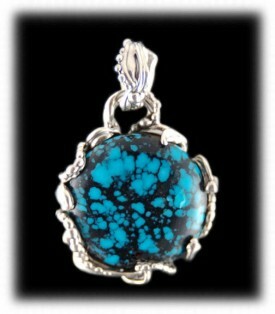 Because Lone Mountain Turquoise holds its beautiful blue color well, it is a great addition to one's jewelry collection. Lone Mountain Turquoise like the turquoise pictured is very rare these days, now the mine produces a light grayish blue color turquoise to a Robin's Egg Blue color Turquoise. 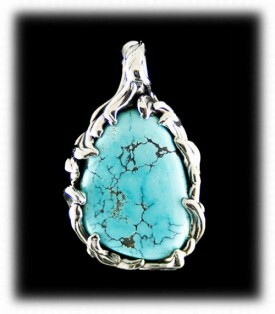 There seems to be very little spiderweb Turquoise coming out of the Lone Mountain Turquoise mine these days. Once in a while the miners will find a rare fossil that has been replaced with Lone Mountain Turquoise. 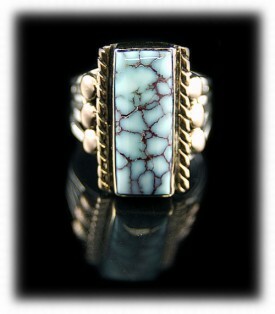 An American Turquoise Classic.gem silica. Killer in silver jewelry. Lucky Peak Turquoise is from a new deposit in Crescent Valley, Nevada. This newer Nevada Turquoise mine produces beautiful shades of green and blue are being mined and as they get deeper in the mine the blue gets harder and darker. 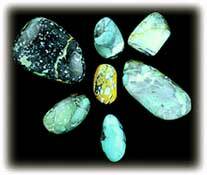 The Lucky Peak Turquoise usually comes out in veins rather than Turquoise nuggets or nodules as does most Turquoise in the world. The Lucky Peak Turquoise seems to run in limonite matrix. A lot of the material from the Lucky Peak Turquoise mine in Nevada looks very simular to Royston, Pilot Mountain and a few other Nevada Turquoise Mines. So far this is one of the Nevada Turquoise mines that has been hard to get Turquoise from.... we will see what happens in the future with this small mine. Thank you for reading about Nevada Turquoise Mines. We hope that this page as well as the rest of our Turquoise informational pages have been very helpful and educational to you. 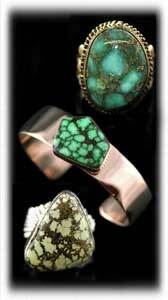 It has been our pleasure to show you the different looks and colors of Nevada Turquoise Mines.